All-Star Batman #2 Cover Art by John Romita Jr.
Last Thursday witnessed the 2016 Fall Equinox, meaning that till late December, the days will be woefully shorter and the temperatures much lower. Appropriately, many of our favorite covers of September 2016 embrace the aesthetic of a setting sun. Whether it’s Phillip Light’s delightfully textured D&D take on Adventure Time (is every take on Adventure Time D&D?) 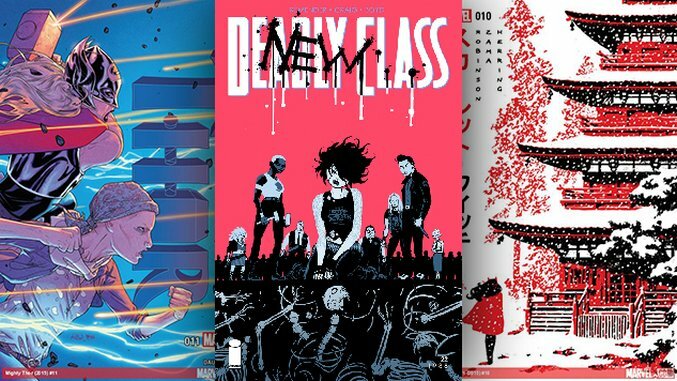 or Wes Craig’s elegiac reflection on the brutal previous issues of Deadly Class (Willie did not deserve that), these visuals mark a rest and turning point in these comics—a denouement before the next cycle of story picks up. Elsewhere this month, Rafael Albuquerque has some fun with worm’s-eye perspective in Batgirl, Michael Walsh plays with ‘80s horror tropes in Carnage, Ian Bertram makes us reconsider our lunch break in House of Penance and David Aja makes it impossible not to mention David Aja again in Scarlet Witch.